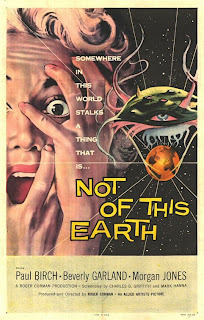 Not of this Earth (1957) is one of director/producer Roger Corman’s earliest science-fiction efforts, and one of his best. 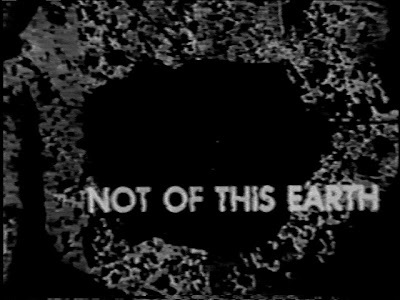 It followed on the heels of Day the World Ended (1955) and It Conquered the World (1956) and directly preceded one of his more notoriously enjoyable titles Attack of the Crab Monsters (1957). These films possess charm chiefly through the obvious enthusiasm for the material, but in terms of filmmaking were never able to escape their poverty row production values. 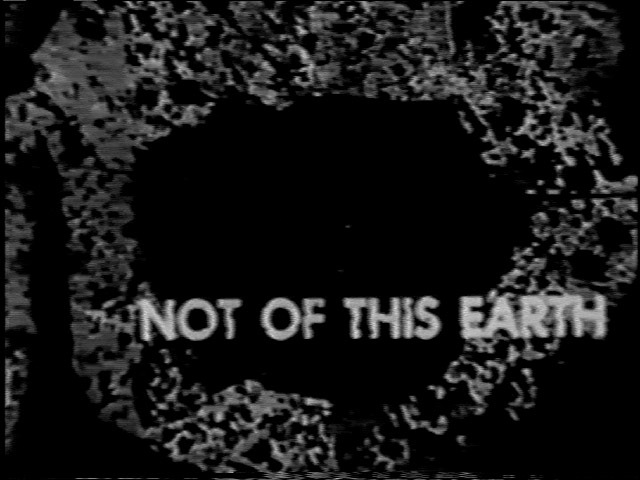 Not of This Earth is slightly different, and feels like a much more professional production. The performances are of particular note and Corman composes some finely structured sequences of suspense. But the major difference is in the tone and atmosphere of the piece. This film perhaps more than any illustrated the manner in which the horror film had been absorbed into science fiction in the 1950’s. 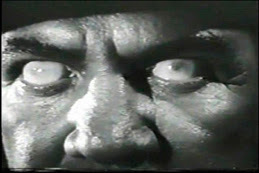 The writers Charles B. Griffith (who also wrote a number of other Corman films such as A Bucket of Blood (1959), The Little Shop of Horrors (1960) and The Wild Angels (1966)) and Mark Hanna offer up an interesting interpretation of vampirism for a post war America paranoid about nuclear annihilation. The success of the film almost completely rests on the chilling performance by Paul Birch as the enigmatic and introverted Mr. Johnson. With his ubiquitous sunglasses, black suit, and icy demeanour, Johnson radiates an image that puts him at odds with the sunny Southern Californian town the film is situated in. He exudes an awkwardness toward simple social interaction, but time and again proves himself to be intelligent and adept, especially with regard to issues of biology and medicine. Unsurprisingly Johnson turns out to be an alien agent from the doomed planet of Davana. His race have been decimated by nuclear conflict and now it is up to Johnson to measure the suitability of human blood through regular transfusions into his own blood stream. Johnson is both a vampire and a guinea pig. Of course he gains much of the blood he requires by murdering the locals. A bunch of drunken vagabonds for example are lured back to his luxurious house with promises of food and booze. After they have dined they are slaughtered, their bodies are burned in an incinerator Johnson has conveniently installed in his basement. The brief running time of the film naturally means that much is left unexplained. For example how does Johnson come by his wealth? How long has he been on Earth? Why hasn’t his murderous actions raised greater suspicion? The police investigation is typically perfunctory, inefficient, and clueless. The question of Johnson’s wealth is important because he is able to install an alien device for transporting matter to and from his planet in a cupboard in his study without arousing suspicion. Furthermore the acrid stench of burning flesh that emanates from the chimney of his basement also goes undetected. This tells us a lot about American suburban life in the 1950’s - emphasis is placed on docility and an unthinking culture of trust - or maybe they're just plain dumb. Johnson has a novel way for killing his victims. Once the sunglasses are off we see his terrifying alien eyes (genuinely effective the first time) and he burns the victims brains out with his steely gaze. Despite these narrative shortcomings the ’otherness’ of Johnson is extremely well conveyed. It is the pliant and easily deceived human beings who lack credibility. One of the most disturbing moments comes when Johnson encounters another person from his home planet. A woman who has fled her doomed world in an act of rebellion. Johnson opts to use his initiative and after breaking into a local hospital gives her a blood transfusion - unfortunately the blood she receives is riddled with rabies! By this point the restraint Corman has shown goes out of the window and the film rapidly degenerates. Johnson somehow unleashes a weird alien creature which kills the doctor Johnson has hitherto had under his command, and the final chase sequence which concludes the film is rushed and ill conceived. These are minor grumbles because generally Not of this Earth maintains its tone of subtle hysteria throughout and its allegorical underpinnings are able to spring forth. The imagery of the ‘Man in Black’ is prevalent, and its ultimate message is an anti-nuclear one. The military, surprisingly, is totally absent from the proceedings (probably for budgetary reasons) but the forces of science and police authority work in cooperation. The medical profession is viewed as weak and easily duped, suggesting that the experts can easily be manipulated by a foreign force. The film has some radical elements within it, but closure is typically conservative. 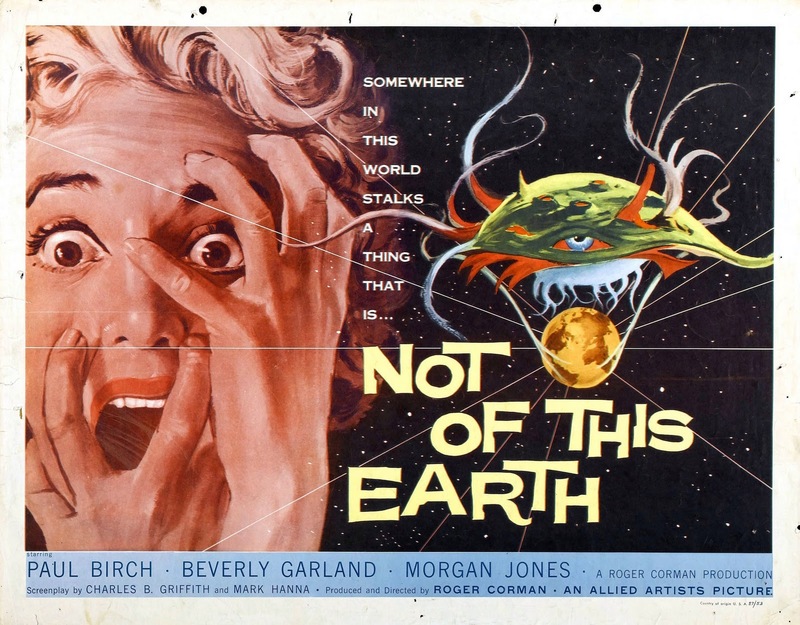 This is quite an adult science-fiction film, and at this stage in Corman’s directing career has to be considered a substantial work. Sounds like it will make for a great watch! Im gonna be watching! 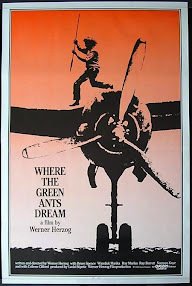 I love movies like these, though I have to admit, the cheesy looking 50's poster does not make you think that the movie is the way you described it. For some reason it makes me think of giant cheesy looking monsters. I like this kind of review, the kind that makes me want to see the movie instantly! BTW, Ill be watching the Corman produced Forbidden World tonite! Expect a review tomorrow, when Ill be celebrating The Film Connoisseurs first full year! Cheers Franco! - yes the poster does give a false impression...you wouldnt expect it to be black and white for a start - a decision which really adds to the atmosphere. 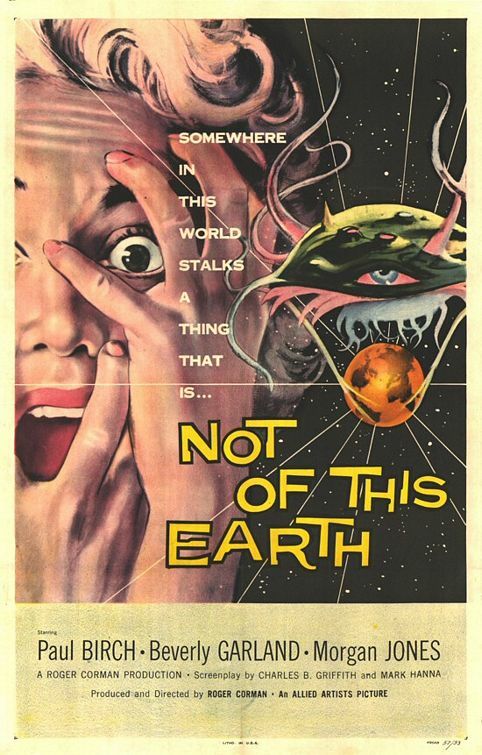 Its a step up from Corman's other sci-fi films of the 50's. I look forward to your review of FORBIDDEN WORLD (I watched myself about a month or so ago). Look out for more Corman fun on here at the end of the week...thanks for stopping by.